For a lot of young people who grow up and realise that they identify as queer and trans*, the armed forces doesn’t really figure as a viable career path. There’s no denying that the common perceptions of a hyper-masculine and strict environment, as well as the famous history of opposition to queer and trans* people serving deters queer and trans* youth from considering the defence force as a career. Before yesterday, I’d never met a queer or trans* identifying member of the military. I wasn’t naïve enough to think that that was because they didn’t exist, just that I didn’t think it was something that was talked about and certainly not something that was celebrated. 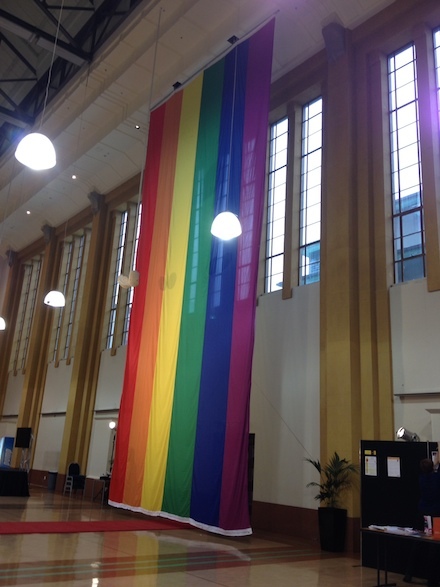 But then I walked in to the Diversity in Defence Conference held by the New Zealand Defence Force (NZDF) and saw this gigantic rainbow flag hanging in the foyer (seriously, it was huge. I stared at it like this guy). Right from the word go, the conference defied expectations. 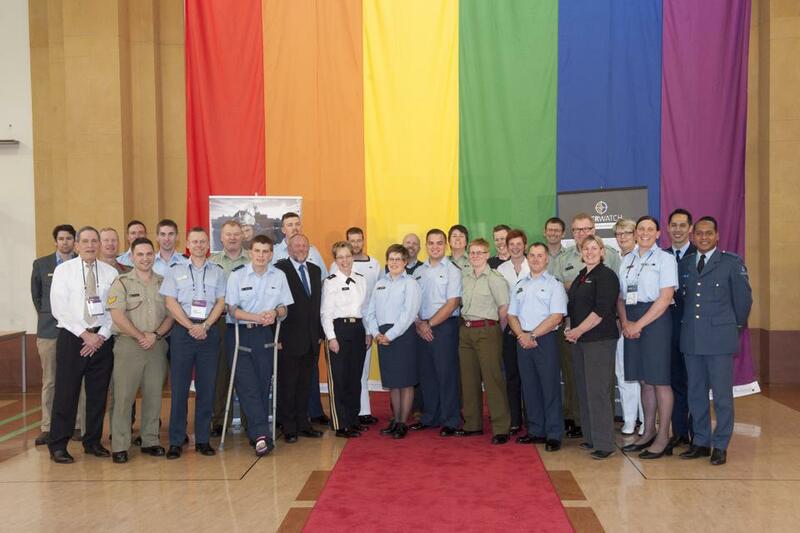 Over two days we listened to discussions relating to the functioning of Overwatch, the NZDF service which works to support queer and trans* service members in the Armed, Naval and Air Forces. Diversity and inclusion in the wider area of businesses and organisations was also discussed, with representatives from Coca-Cola Amatil and ANZ sharing stories of how their organisations embrace the interests of queer and trans* employees as well as clients. Michael Stevens from Affinity New Zealand spoke about The Rainbow Tick, an initiative to provide businesses and organisations that meet a high standard of diversity, inclusion and safety with a confidence mark in the form of…well, a rainbow tick. 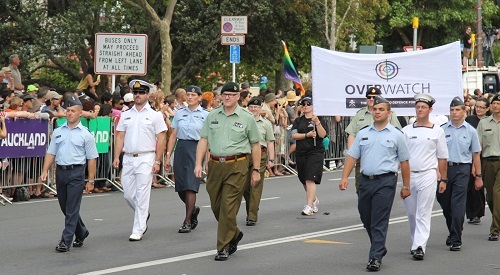 1) The fact that the Chief of the New Zealand Defence Force (aka, the dude at the top), Lieutenant General Rhys Jones not only endorses Overwatch but is actually going to march with them in the 2014 Auckland Pride Parade. How cool is that? 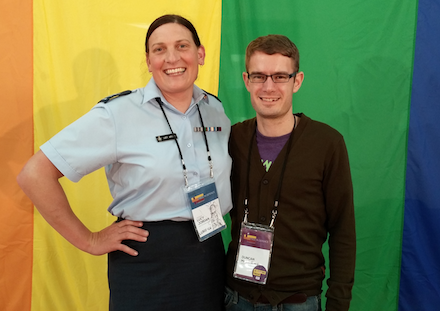 2) Speaking of marching in the pride parade, I chatted to an Airman who marched in the parade earlier this year and told us it was one of the proudest moments of his life. He was stunned at the reaction from the crowd who, as soon as they caught sight of the Overwatch members marching down the road, went crazy cheering. He said that first time in his life, people were cheering not just because he was in uniform; they were cheering for him because he was being himself– which was something the Airman never thought he’d be able to celebrate while wearing his uniform. 3) After lunch on the first day of the conference, we had a wreath laying ceremony in the Hall of Memories. These ceremonies to remember those who have given their lives for New Zealand always give me Goosebumps and I dare anyone not to be moved when hearing the Last Post. But this wreath laying ceremony was the most powerful I’d ever been to. We were crowded closely together in the War Memorial Carillon, as the Hall of Memories was being earthquake proofed. There we paid special respects to all the unknown queer & trans* soldiers who sacrificed for their country, the ones that all the other memorial ceremonies I’ve been to have never spoken about. It brought tears to my eyes and looking around, I saw that others were similarly moved. 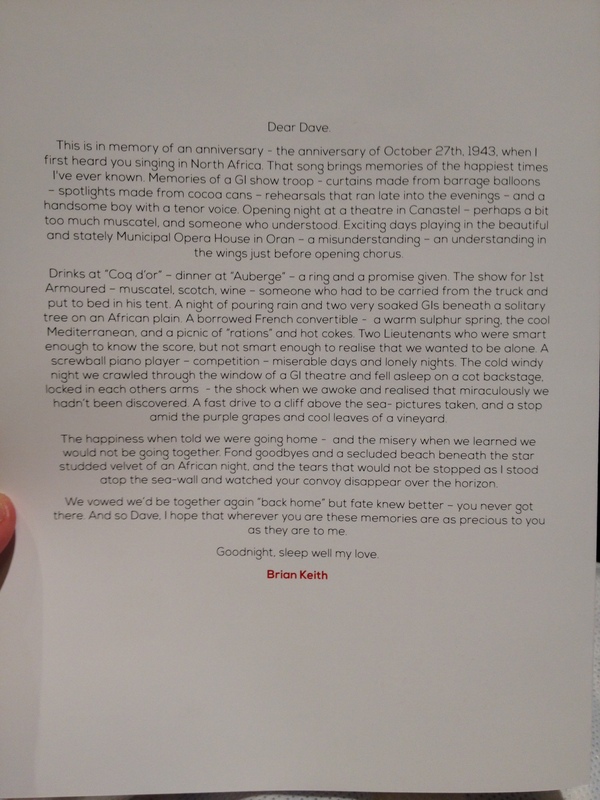 A beautiful letter included in the Wreath Laying Ceremony Programme between two American Servicemen during WW2. 4) The conference brought together members of foreign militaries from England, America, the Netherlands and Australia. One of them, an ex-marine from the U.S, approached the Rainbow Youth stand to find out what we did. We began talking about marriage equality passing in New Zealand and the ex-marine said that he’d been so moved watching our Parliament break into Pokarekare Ana when the Marriage Equality Bill passed in April that he decided he wanted to use it as his wedding song back in the states. 5) At the RY stand, we had some WTFNZ stickers that proved to be pretty popular. The greatest moment was the resident chaplain from the NZDF asked with a cheeky grin if he could take several for his office and his diary. It was so great to know that not only the New Zealand Military, but some of the religious faculties included within it are ‘So F**king Proud’! 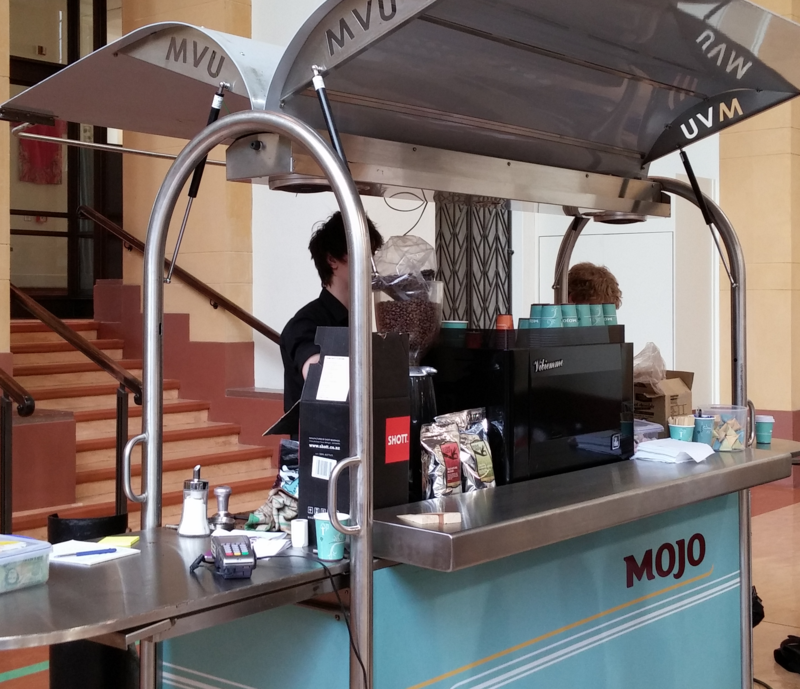 A special mention also has to go to Mojo Coffee, who very generously donated $1 of every cup sold at the conference to RY and OUTLine! The Inaugural Pride in Defence conference marked a breaking down of boundaries and also showed how forward thinking and modern our Defence Force is. Knowing that our military is putting their best foot forward in being one of the most inclusive militaries in the world is very affirming as a queer person who grew up thinking that the military would be the last place that I would be welcome. The fact that the New Zealand Defence Force welcomes queer and trans* recruits exemplifies one more way that bit by bit, the world is opening up for us.